Small changes can yield big results, so use these tips to up your game. I’ve spent the last 21 years in the boat helping people progress behind it. Some changes take a long time, but plenty of others can happen in an instant. Here are 10 quick watersports hacks to make your time on the water easier and more enjoyable. 1. Hold on loosely. People tend to create a couple of problems for themselves while riding or skiing: sore hands and tired arms. Both come from holding on too tightly. You want to hold the handle more in your fingertips and less in the palm of your hand. Doing so will take a lot of pressure off your hands and arms and allow you to ski longer — and in better position. 2. Give it the gas and brake. While surfing, think of your front foot as the gas pedal and your back foot as the brake. If you shift weight over your front foot, you speed up; if you put weight on your back foot, you slow down. With this in mind, make micro-movements to start. That way, you can control your speed instead of just rushing toward the boat or falling out of the pocket. 3. Keep it planted. 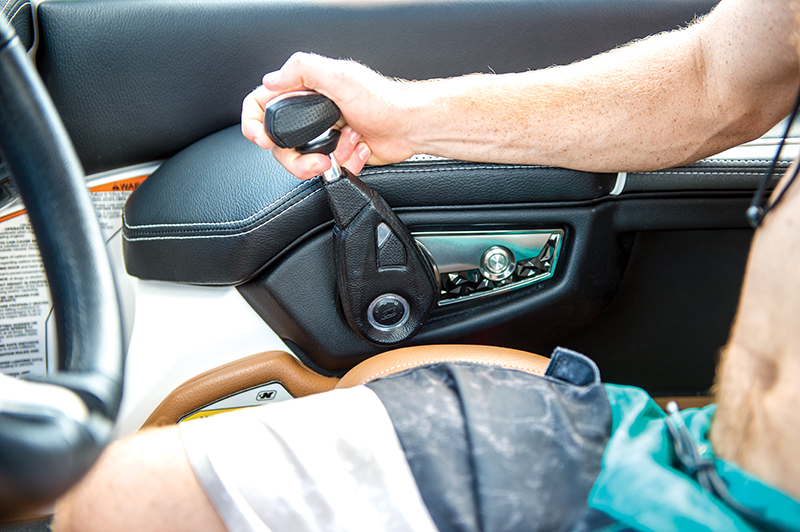 While driving the boat, keep your arm fully planted on the armrest and your hand on the throttle, which will allow you to make smaller, more controlled adjustments in speed instead of large abrupt ones. The pull will be smoother for the skier and the riders in the boat, whether it’s on the startup, the ride or after the fall. 4. Get the boot. When you put your boots on, if you have a platform on your boat, position things so the toes of the boots are facing the back of the boat. Most people put the heels toward the boat, but there are two problems with this. First, you put a binding on by using heel pressure, so if you are standing up you can use the heel pressure to get it on. 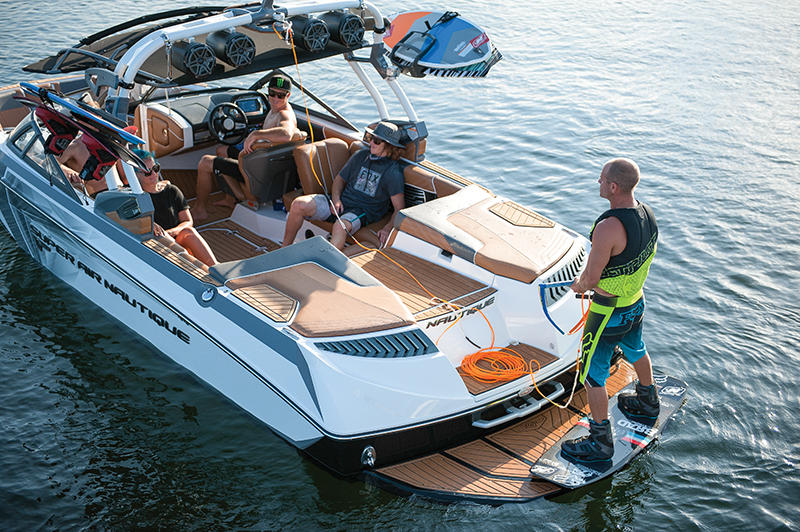 If you are sitting on the back of the boat, you are just shoving your toes in the boot and more than likely kicking the back of the boat with the board, which is the second problem with a toesout posture. So get your bindings on easier and save the gelcoat on your beautiful boat at the same time. 5. Point the arrow. One thing we always emphasize with our students — riding or skiing — is to make sure they keep their body in a leaning position. 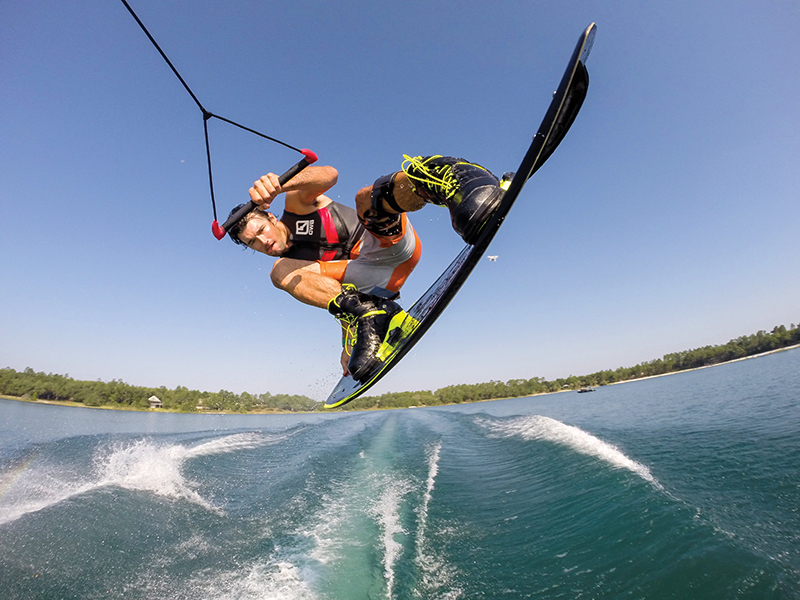 Most people have a tendency to let off when they hit the wake. Doing so takes away the support the rope is providing, and now, instead of getting help from the rope, a rider only has momentum to get him across the wakes. To keep this from happening, pretend you have an arrow that starts at the center of your board and comes out the top of your head. You want to keep the arrow pointing away from the boat at all times. You never want it pointed upward, and you definitely don’t want it pointing toward the boat. 6. Stand tall. This can go along with the arrow. While skiing or riding, you want to stay nice and tall. Sure, you are going to have a little bend in your knees, but you want to make sure you have your hips and your chest up. A lot beginners will drop really low, thinking it’s a safety position. Actually, if you stand taller, you are in a stronger position, and if something happens you have a little wiggle room. If you are in a crouch and something happens, chances are you’re going straight to your face. 7. Roll it tight. Tired of your rope always being in knots? Try using small rolls while winding the rope up. Make the rolls no more than 12 to 15 inches in diameter. The rope will coil up nicely in little circles instead of those figure-eights that can so easily get tangled up when the rope is unwinding. 8. Eyes up. Your eyes play a major role in what you are doing. A lot of people have a tendency to look right where they are instead of where they are going. It’s fine to look down, but look out in front of you. When you are riding a bike, you don’t stare at the front tire; you are looking down but constantly scanning the road out in front of you. You want to do the same thing on the water. 9. Bigger is better. When choosing a board, if you are on the cusp of going smaller or bigger, always go bigger. Don’t get caught up thinking that a bigger board will be heavier or harder to maneuver. It actually makes things easier for you. It’s a bigger platform to stand on and to land on, and it’s more forgiving, so you don’t have to stand so perfectly over the board. 10. Take it slow. People often make the mistake of trying to learn things going too quickly. When you are working on new tricks, do them with the boat going slower and over just one wake, instead of wake to wake. Get things sorted out at a slower speed — and take some pain out of the learning process.